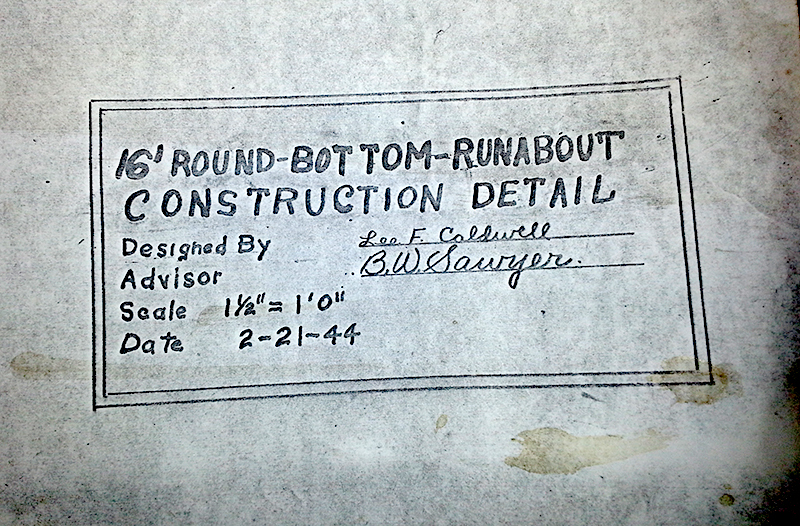 In 1940 Lee Caldwell, a South Kitsap High School senior, laid the keel of his dreamboat in a high school shop class. The gasoline powered 16’ launch was a design not unlike many Puget Sound small fishing boats of the day, perhaps inspired by the renowned Poulsbo Boat. Caldwell finished the boatbuilding project after high school with the help of local shipwright Tom Tomlinson, who gave Caldwell space in his shop and some experienced help. When Caldwell’s first daughter, Gaylynn, arrived in 1943 the little launch received a name - Gaylynn. Towards the end of the 1940’s as Caldwell’s family grew and life got busy the Gaylynn was stored away, temporarily. Turn’s out that “temporary” was for 65 years. Thankfully she was stored under cover and remained dry for that whole time, at first by Mr. Caldwell then by a friend Allan Kane, who purchased the boat with the best intentions of restoring the launch to her 1943 glory. 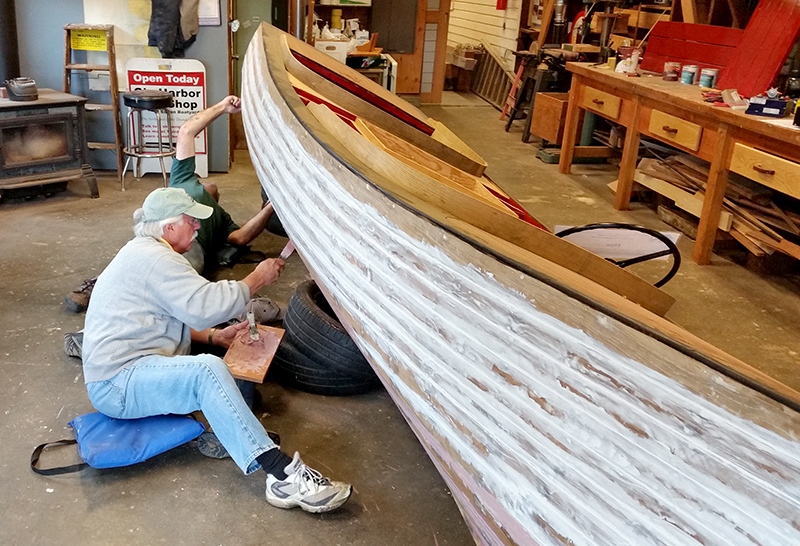 In 2014 Kane was participating in the Gig Harbor BoatShop’s Community Boat Restoration Program repairing another period Puget Sound boat when he had an idea. Allan thought that the Gaylynn would be a worthy next-project for the BoatShop’s boat restoration program. Tom Regan, the BoatShop’s Community Boat Restoration Program leader and master small boat builder, and I went out to the Kane home in Olalla to inspect. Tom gave Allan’s idea the thumbs-up and the boat was donated to its third home, the Gig Harbor BoatShop at the historic Eddon Boatyard. The Gaylynn was remarkably intact on arrival due to decades of dry storage, however, given the boat’s future public use as a BoatShop livery vessel, Regan felt that the boat should be repowered electrically and removed the classic, but noisy and volatile, gasoline engine. In so doing the original decks were modified to fashion a dry engine space and to create a second cockpit. Otherwise the original fabric of the vessel is largely intact. After a year’s restoration the Gaylynn was ready to launch in September of 2015. Her re-christening celebration took place at the Port Townsend Wooden Boat Festival. Perhaps the best part of this preservation story was that Gaylynn was re-christened by her builder, Lee Caldwell, who at 93 years of age had the pleasure of seeing his 75-year-old shop project beautifully restored and put back into service. Caldwell with shaky hands poured a bit of champagne on Gaylynn’s foredeck and bow to honor the occasion and to bless her new life as a Gig Harbor BoatShop livery boat. The most unique of BoatShop restored boats, like Gaylynn, are made available for public use by being placed into the Gig Harbor BoatShop Livery Service. At the BoatShop there is an interest in providing the community with boat building and repair opportunities, and boat use opportunities. In June of 2016 the Gaylynn will be available for the public to enjoy on the waters of Gig Harbor Bay.